Welcome to www.BlitzCommunity.com! A great game needs a great community. Please join us here to enjoy Blitz! A World in Conflict. The game is now available for purchase at the Compass Games website! New! Review by Dennis, Russ and group: Download the PDF. Thanks for letting me post this here guys! A recent review by gamer Bjorn Engqvist from Sweden aptly sums up the game: “I was introduced to this game almost by chance but was quickly convinced that it fills a need that no other game can fill: a global war with a fair amount of realism; simple gameplay; accomodating teams of 2 v 3 as well as 1 on 1; and in maybe 8-10 hours’ time and has mechanics for autowin? Who ever tried to do that, let alone succeeded?” Read his complete post from May 17, 2016. Blitz! A World in Conflict is a grand strategy game where players fight all the battles and manage all the economies of the five major powers who fought World War II: Germany and Japan for the Axis, and for the Allies: the Anglo-French Alliance (Great Britain, France, the British Commonwealth nations, and all of their colonies), the United States of America, and the Union of Soviet Socialist Republics. 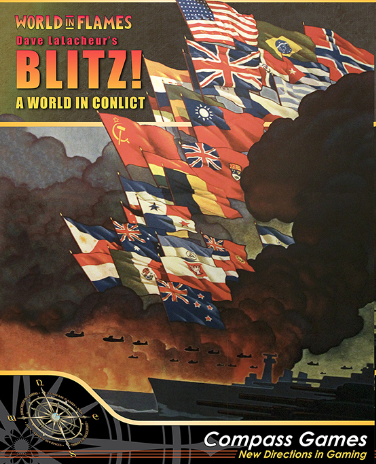 Developed in cooperation with the Australian Design Group and published by Compass Games, Blitz! A World in Conflict brings the award-winning tradition of World in Flames™ into a re-imagined format that is much faster to play, with beautiful components, while maintaining World in Flames’ premiere historical accuracy.